The idea of a famous sporting arms maker subcontracting production to an overseas manufacturer is not new. In this instance, the phrase “made in Japan to BSA specification” has a ring to it that has echoed down through the years until such practice has become almost commonplace. In the inter-war period, BSA made its own range of highly regarded side-by-sides, but the factory was badly damaged during World War II. Sadly, production of double-barrelled guns never resumed post-war, instead BSA concentrated on rifles and single-barrel shotguns. In the 1960s, to extend its range, it marketed a range of shotguns manufactured by SKB Arms Company based in Tokyo, which also had Browning and Weatherby on its books at different times. These included over-and-unders, semi-autos and the somewhat less common side-by-side. Model designations bore number grading and this 200E sports a remarkably upmarket specification as a single selective trigger ejector gun. The walnut is sound, though not particularly fancy. The decoration around the action body and furniture is unusual in that it is raised up in relief rather than the more normal engraving, either by machine or hand, and cut into the steel. The decoration on this SKB is quite eye-catching. The overall styling is that of an English side-by-side with its straight-hand stock and modest-sized fore-end. This gun had a centre bead part-way along the raised top rib, but it has been cut off flush, leaving the neat brass foresight bead, a modification that is an improvement. So much about this shotgun is familiar, such as the Anson push rod fore-end release, the dowel pins through the action body, the shape of the top-lever and the nicely proportioned auto-safe button. As for the scroll-back styling to the action body, this is what you might expect on much more expensive English guns, along with the hand-cut flat-top chequering. Initially, there were some reliability problems and, with the first guns, stocks were a bit short. However, between BSA and SKB these matters were soon sorted out. In 1965 the Model 200 retailed at around £60, which was something of a bargain considering the specification. 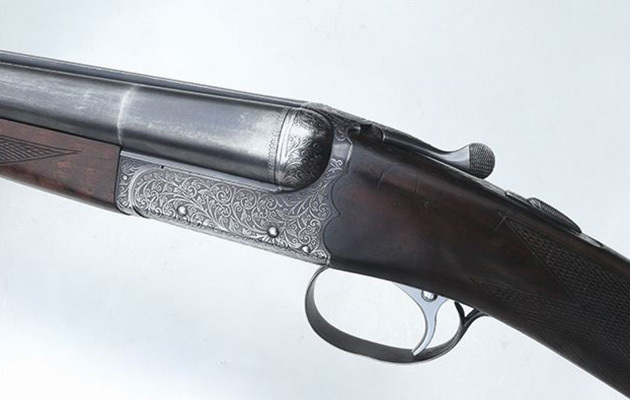 What would have been considered a little unusual at the time on a side-by-side is the monobloc barrel construction, with the band of faux engraving where the barrel spigots into the monobloc. The barrel selector is situated in the trigger, which is actually very effective but gives the appearance of some sort of trigger lock safety associated with cheaper guns. The fore-end feels a bit flat underneath and the hand of the stock is also a little flattened either side of the trigger-guard tang (or tail). It is, though, a fairly light gun, barely 7lb loaded, and with the 28in barrels it balances well. The Model 200E had all the ingredients to make it a winner, and the fine quality of manufacture is evident, even on a cursory examination. It is built in a familiar manner, it looks right and is choked quarter-and-half, which is a good compromise between the very open “game” boring and the tight chokes of many overseas competitors. However, it did not sell as well as the over-and-unders. It is a pity and these BSA/SKB side-by-sides are now not common, as they are an interesting addition to the history of sporting firearms. Value: A good example circa £400, sound but scruffy around £150.